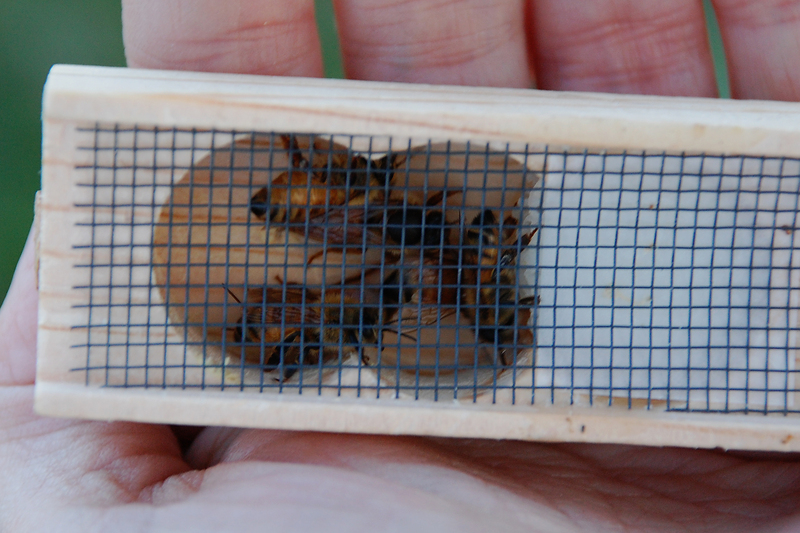 Here is the new queen in her cage with a few attendant bees. 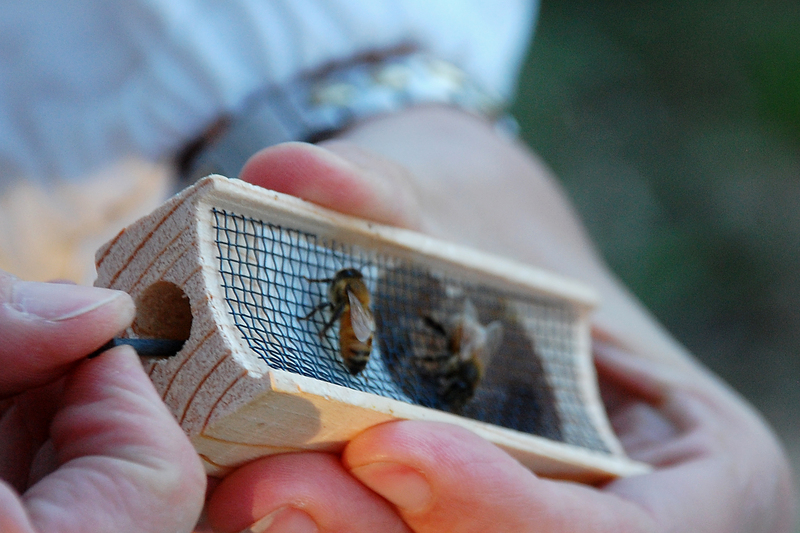 The white stuff on the right is a sugar candy substance placed in the cage for them to feed on during their journey to a new hive. Re-queening the hive at this time of year is done by a slow-release method, whereby you place the caged queen into the hive and allow the bees to adjust to her during the time it takes them to eat through the candy plug. The cork on the candy end needs to first be removed. After removing the cork, I took a small nail and poked gently all the way through the candy substance, being careful not to skewer our new queen. I then moved two frames containing a lot of bees apart just far enough so that I could wedge the cage in between them with the candy side down. The bees are expected to take 3-4 days to eat through the candy and get to the new queen. The bees were very riled up when I was messing with their hive. A queen-less hive is a crabby hive. Our bee supplier told me not to open the hive for about 10 days to check on how things are going. In the meantime, we will be crossing our fingers and hoping that they get the new queen bee safely out of the cage and that they like her! I agree that having bees is so fascinating. I was skeptical in the beginning, but it has far exceeded my expectations. Do you just have one hive? 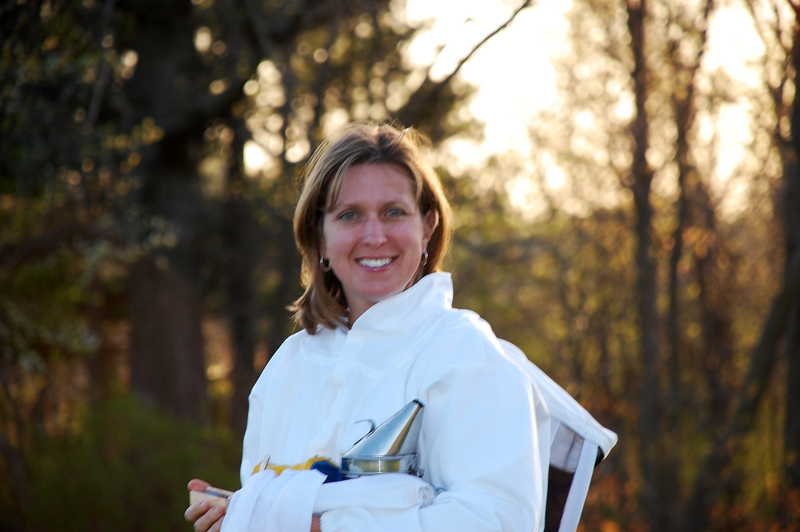 I noticed on your blog that you had colony collapse disorder with your previous one. So sad.